The cooler weather is hinting that the holidays are right around the corner, which means that the end of the year is upon us. 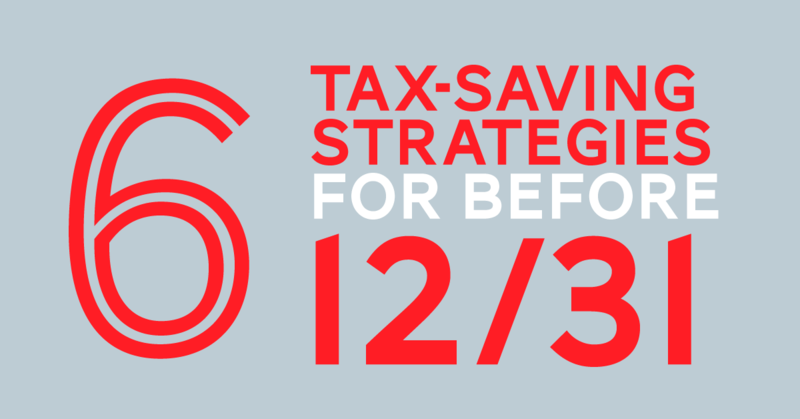 Now is the right time to plan your year-end tax strategy in order to maximize your savings before December 31st! Does your business need a new piece of equipment or machinery? It may benefit you to consider buying and placing in service this piece of machinery and equipment before year-end in order to take advantage of the Section 179 deduction. Section 179 allows a business to expense up to $500,000 of eligible asset purchases in the year the assets are placed in service, in lieu of depreciating the assets over several years. Eligible 179 property includes: new or used machinery, equipment, vehicles, computer software purchased off the shelf, non-real estate-property, qualified restaurant property, retail improvements, and leasehold improvements. An individual or corporation should consider accelerating income from 2017 to 2016, if it will be in a higher bracket next year. On the flip side, it should consider deferring income until 2017 if it will be in a higher bracket this year. Outcomes of the recent presidential election play a large role in future tax rates; please be sure to speak with your CPA regarding their thoughts on this matter. Does your business qualify as a domestic producer? The Domestic Production Activities Deduction (DPAD) is one of the largest domestic corporate tax breaks, and if your business qualifies for the DPAD, consider whether the 50%-of-W-2 wages limitation has been met. Please be sure to contact your tax advisor regarding the details of the DPAD and its limitations. To reduce 2016 taxable income, consider disposing of a passive activity (i.e., rental property) in 2016, if doing so will allow you to deduct suspended passive activity losses against passive activity income. If you own an interest in a partnership or S corporation, consider whether you need to increase your basis in the business so you can deduct a loss from it for this year. Your tax advisor can provide more details regarding basis and the limitations therein. Would paying more or all of your state tax before year-end help reduce your 2016 federal tax liability? This is something to consider during your year-end tax planning. What is the sweet spot between paying in the right amount of state tax to reduce your Federal Tax Liability before triggering the Alternative-Minimum-Tax (AMT)? Your tax advisors at Milam, Knecht & Warner, LLP can run the scenario analysis specific to your situation. These are just a few of the tax planning tools and strategies to consider as you near the end of the year. Please be sure to set an appointment with your tax advisor soon to ensure that they can help you maximize your tax savings! If you have any questions about this please contact us or comment below. Emily Tafua, CPA, is a Senior Accountant at Milam, Knecht & Warner, LLP. She has a bachelor’s degree in accounting from Brigham Young University (BYU). Outside of work, Emily loves to read, watch Netflix, hike, swim, hang out with family & friends, and go on small get-a-ways with her husband.